You can easily achieve a custom look in your kitchen or bath, or in any room, with switch plates to match your Corian® Counter. To verify color, please see actual Corian® at your local Corian® dealer. Sorry, these items are made to order and with so many color and size options, we DO NOT CREDIT any returns for any reason. Of course, if there is a workmanship issue, we'll be happy to replace the item in question. 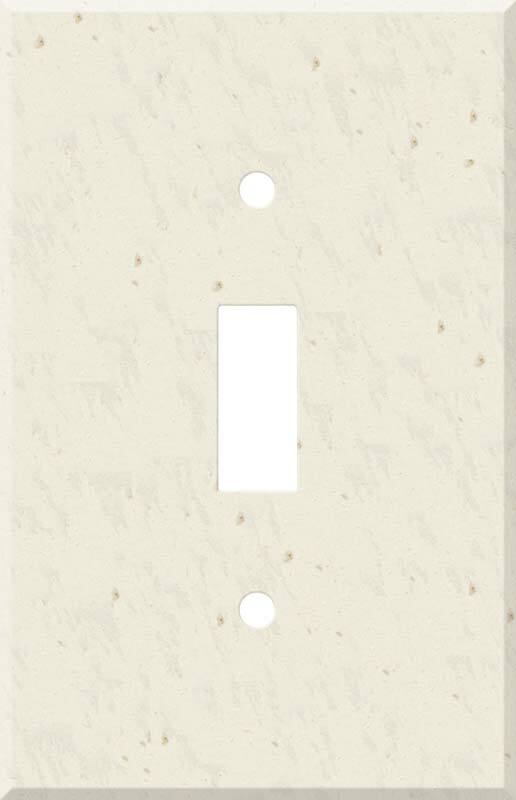 100% DuPont Corian® light switch plates. Screws provided by fabricator are included. Clean Corian® Rice Paper light switch plate covers with mild soap and warm water. Do Not use abrasives. Usually Ships: within 1-2 weeks. The number of days for an Express Mail package can vary from city to city. Please check with your postmaster or usps.com to verify the shipping times from our zip code, 14219. Usually ships within 1-2 weeks..
Configuration / Dimensions Price Qty. 2.75 w" x 4.5 h"
4.5 w" x 4.5 h"
6.375 w" x 4.5 h"
8.25 w" x 4.5 h"
10 w" x 4.5 h"
11.75 w" x 4.5 h"
This switchplate can be flipped 180° to fit your hardware. #1 Corian Rice Paper Wall Plate & Outlet Cover vendor. Widest selection in stock. Immediate & Free Shipping. 5,000+ Reviews.